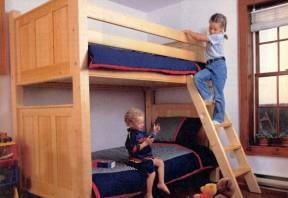 Choose from the many free woodworking plans available for bunk beds. Layering one bed on the other will save space in any bedroom. There's even bunk bed plans below for a full bed topped by a twin bed. 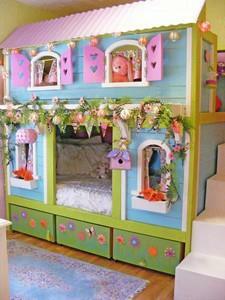 Related pages: Bed Plans, Bed Plans - Children's, Cradle Plans, Headboard Plans, Loft Bed Plans, Bedroom Furniture Plans. 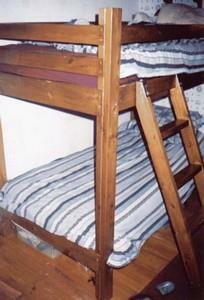 Build a bunk bed that looks like a charming cottage with windows on the top and bottom and a stairway on the side. 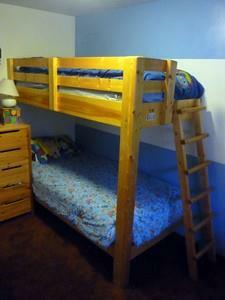 You can built this basic bunk bed with ladder and safety railing using this plan with diagrams. 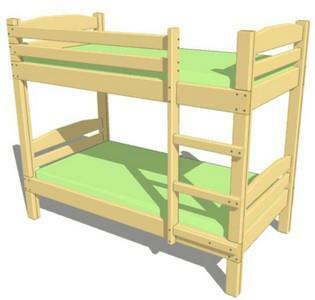 This is a project for creating a strong and study cabin style twin bunk bed using these instructions. 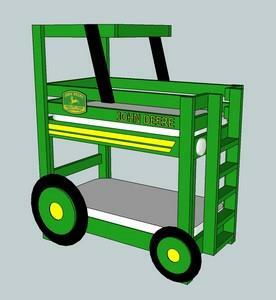 Here is a bunk bed that is designed to look like a tractor; it has wheels on the lower portion and a cab on the top. 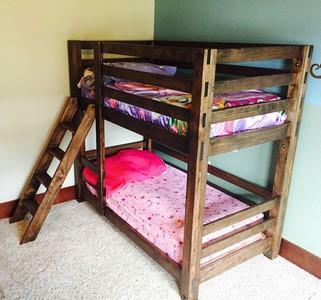 Build this attractive bunk bed using construction grade 2 x 10s. Bed has a safety rail on the top bunk and a side ladder. This is a woodworking project for a handsome twin bunk bed with slated wood sides and a guard rail on both sides of the top bunk. Here is a bunk bed that is built-in to the corner of a bedroom and has only one leg on the outside corner of the frame. Create this unique bunk bed that can be easily assembled and disassembled for ease of moving or to put into storage. 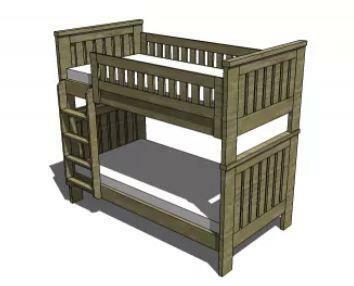 If you are looking for a rugged, simple, and yet, practical bunk bed plan, here is one that will help you achieve a very pleasant look with just a little effort. 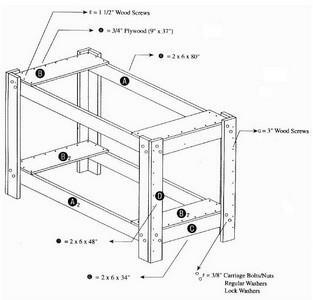 Material list, pictures and diagrams help you build this bunk bed to enjoy for years to come. 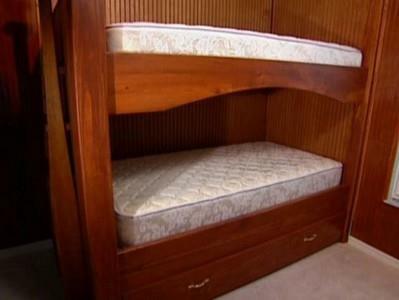 A bunk bed that is strong, inexpensive and easy to build and will last and last.